I was excited to see that WebMD actually put a "what is CrossFit" article on its webpage recently. IT just goes to show how mainstream it is getting. HOwever there was one thing that i disagreed with. It said that if you were not a workout person or you were out of shape that basically you should get involved with less intensive workout program first because this would be to difficult for you. The person that wrote the article doesnt seem to understand what CrossFit is. Yes, it is an INTENSE workout program. Yes, in most boxes you will see sweating and breathing very hard. Yes, people love to talk about how hard it is. BUT, this is NOT how you should be introduced to CrossFit. In CrossFit we talk about Learning Movements, Mastering Movements, THEN increasing INTENSITY of those movements. The point of the workouts is NOT to hammer you into the ground. The purpose of the workout is NOT to see how sore we can make you. As trainers at the INFERNOs, we want to scale each workout based on your own individual abilities and level so that you are able to learn movements. Then as you do them more and more and are cued by our coaches to become more and more efficient, you will gain mastery of the movements. Then you can really pour it on and increase the intensity to gain those benefits you always hear about. Will we give you a tough workout on your first day? YES! It will be tough, and modified for YOU! When CrossFit programming is done correctly, the workout program truly is made for everyone and everyone CAN do it! THATS RIGHT!!!!! 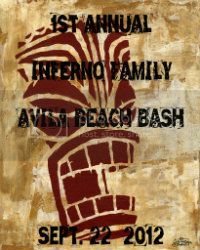 THE 1ST ANNUAL AVILA BEACH BASH COMPETITION WILL BE HELD ON SEPTEMBER 22, 2012!!! CLICK HERE TO GET INFO AND REGISTER FOR THE MOST UNIQUE CROSSFIT COMPETITION AROUND!!! !